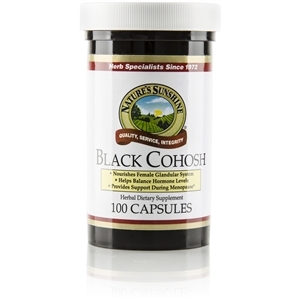 Black cohosh has been valued by many societies for its nutritional support of the female reproductive system. Low estrogen levels have been linked to common female reproductive problems. Black cohosh possesses mild estrogenic properties (phytoestrogens) and helps balance female hormone levels by binding to estrogen receptor sites. Balanced hormone levels help ease common menopausal symptoms. Black cohosh also has antispasmodic properties and helps relax muscle spasms, including those associated with premenstrual and menstrual cycles and stages.